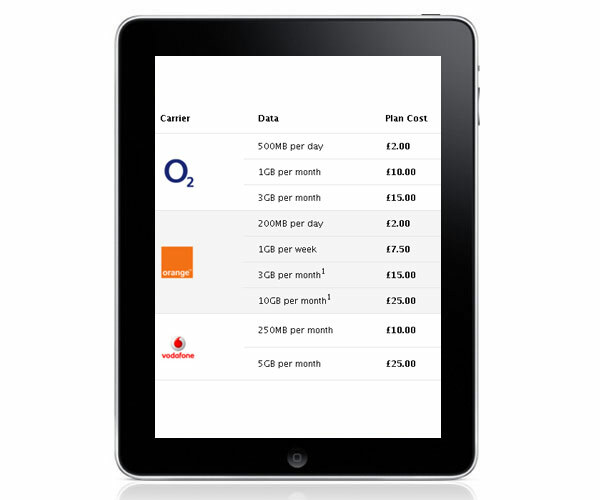 Last week UK mobile phone operator Orange revealed their data plan for the UK iPad, now O2 and Vodafone have released details of what their iPad data plan will cost users. O2 will offer users 500MB a day for a flat fee of £2, or if you go for the monthly plan there are two options, £10 a month gets you 1GB of data whilst £15 a month gets you 3GB of data. Vodafone’s plans are slightly different with 250MB of data available for £10 a month or 5GB of data available for £25 per month. Looking at the information on Apple’s website, the Orange deal looks slightly different than the one they announced last week as you will be able to get 200MB of data per day for £2, 1GB per week for £7.50 a week or 3G per month for £15, plus they also have a top plan which will give you 10GB of data for £25 per month. From the looks of the figures, O2 seem to offer the best deal for 1GB of data at £10 per month for the average user, and if you are a high data user then the 10GB per month from Orange for £25 seems to be about the best deal.